According to Seymour Hersh’s account, the original plan of the Obama Administration regarding the disclosure of the execution of Osama bin Laden to the press was that he had been killed in a drone strike in the Hindu Kush mountains on the Afghan side of the border. But things didn’t go as planned during the operation as a Black Hawk helicopter crashed in Bin Laden’s Abbottabad compound, and the whole town now knew that an operation was underway. Therefore, the original plan was abandoned and the Obama Administration had to go public within hours of the operation with a hurriedly cooked up story. This explains so many contradictions and loopholes in the official version of the story; the biggest being that the United States’ Navy Seals conducted a raid deep inside the Pakistani territory on a garrison town without the permission of the Pakistani authorities. Moreover, according to an AFP report, Pakistan’s military sources have confirmed that there was a defector who had met several times with Jonathan Bank, the CIA’s then-station chief in Islamabad, as a consequence of which Pakistani intelligence disclosed Bank’s name to the local newspapers. He had to leave Pakistan in December 2010 because his cover had been blown. Seymour Hersh posited in his report on the Bin Laden operation in Abbottabad that Saudi Arabia had asked Pakistan as a favor to hide Bin Laden because he was a scion of a powerful Saudi-Yemeni Bin Laden Group and it was simply not possible for the Saudis to hand him over to the US. Moreover, it should be remembered that the Pakistani military and Saudi Arabia have very deep and institutionalized links: thousands of Pakistani retired and serving army officers work on deputations in the Gulf States; furthermore, during the ‘80s, when Saudi Arabia lacked an efficient intelligence set-up, the Pakistani ISI virtually played the role of Saudi Arabia’s foreign intelligence service. But once the Pakistani walk-in colonel told the then-CIA station chief in Islamabad, Jonathan Bank, that a high-value al Qaeda leader was hiding in an ISI safe house in Abbottabad, right next to the Pakistan’s Military Academy, and after the CIA obtained further proof in the form of Bin Laden’s DNA through the fake vaccination program carried out by Dr. Shakil Afridi, then it was no longer possible for the Pakistan’s security establishment to deny the whereabouts of Bin Laden. In his report, Seymour Hersh has already postulated various theories about why it was not possible for Pakistan to simply hand Bin Laden over to the US. Note that in 2011, Pakistan had a liberal and US-friendly People’s Party’s government. It is quite plausible that the then army chief, Ashfaq Pervez Kayani, and the ISI head, Shuja Pasha, might still have had strong objections to the US Navy Seals carrying out an operation in the garrison town of Abbottabad. But Pakistan’s civilian administration under former President Asif Ali Zardari and especially the disgraced Pakistani ambassador to the US, Husain Haqqani, must have persuaded the army chief and the ISI head to order the Pakistan Air Force to stand down during the operation. Ambassador Haqqani’s role in this saga ruffled the feathers of Pakistan’s security establishment to the extent that Husain Haqqani was later implicated in a criminal case regarding his memo to Admiral Mike Mullen, and eventually he had to resign. Moreover, Greg Miller of the Washington Post posited in his May 5 report that Mark Kelton, the CIA station chief in Islamabad at the time of Bin Laden operation in Abbottabad, was poisoned by the ISI. The only purpose of this leak, five years after the operation, seems to be to discredit Seymour Hersh’s account, in which he has proven beyond doubt that Pakistan’s government fully cooperated with the US during the operation. It is not a coincidence that this news report was released within a month of the publication of Seymour Hersh’s book The Killing of Osama bin Laden. It should be remembered here that Mark Kelton succeeded Jonathan Bank in January 2011, after the latter’s name was made public by the ISI due to Bank’s suspicious activities. Hersh mentioned in his report that the Pakistani walk-in colonel had met Jonathan Bank and told the latter that Bin Laden was hiding in a compound in Abbottabad under the custody of ISI. But in order to be sure, the US needed further proof; that’s why they arranged the fake vaccination program run by Dr. Shakil Afridi to get Bin Laden’s DNA samples. The original deal between the Obama and Zardari Administrations was that the story would be made public a week after the operation, as mentioned by Hersh in his report, that Bin Laden has been killed/captured in the Hindu Kush mountains on the Afghan side of the border. 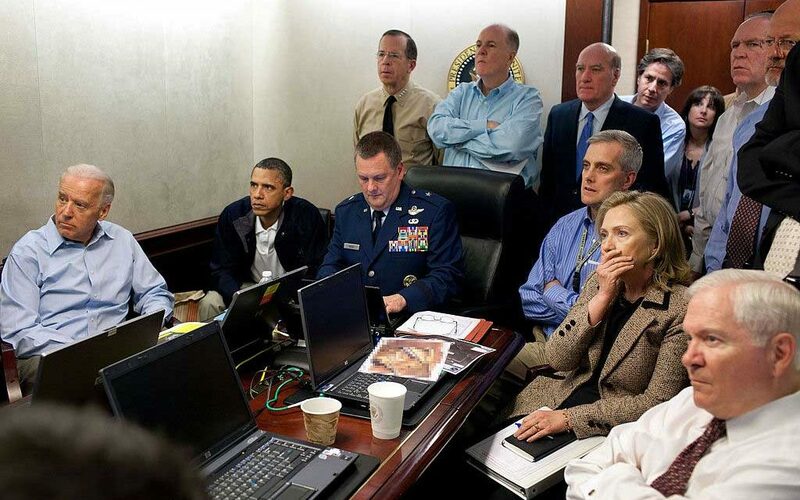 The crashed Black Hawk in Bin Laden’s Abbottabad compound, however, made it impossible. The Obama Administration had to improvise within hours of the operation with a hurriedly cooked up story, and they tried to gain maximum political mileage out of the incident in order to secure a second term for Obama in the presidential elections of 2012. This explains so many contradictions and loopholes in the official version of the story, as I have already mentioned. Seymour Hersh claimed in his version of the story that the Pakistani military authorities were also on-board months before the operation; let me clarify, however, that according to inside sources of Pakistan’s security establishment, only the Pakistani civilian administration under the Zardari-led and the US-friendly People’s Party administration was on-board, while the military authorities, who were instrumental in harboring Bin Laden and his family for five years, were intimated only at the eleventh hour. The fact of the matter is that the mainstream media’s Western audience knows very little about the geography of Pakistan; that’s why they uncritically bought the “official version” of the story. It’s a fact that the Af-Pak border region is the lawless wild west of Pakistan where the US can carry out occasional drone strikes; but the area between the garrison towns of Rawalpindi, Islamabad, and Abbottabad is the hub of Pakistan’s defense production industry and is littered with arms factories, ammunition depots, and ballistic missiles’ manufacturing sites. It simply stretches the limits of one’s credulity to believe that the US Navy Seals conducted a raid in Abbottabad right next to Pakistan’s Military Academy and several battalion headquarters without the permission of the relevant quarters.